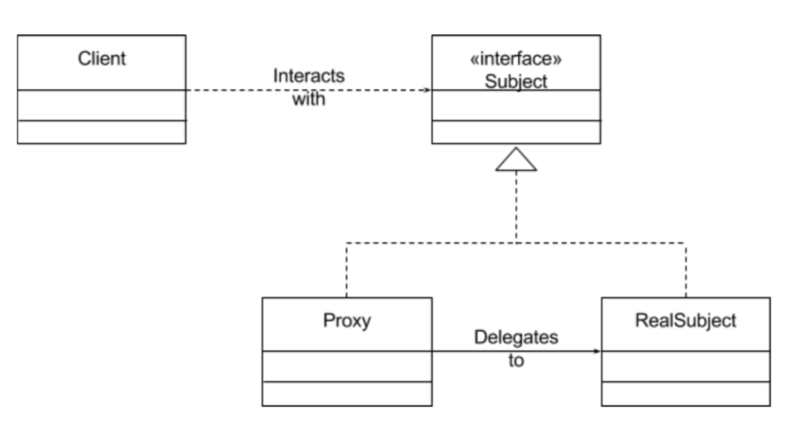 A Proxy design pattern is a structural design pattern. the idea behind is to make a proxy object that is capable of performing tasks similar to the original object. The need for using proxy class could vary but we could depict the following main scenarios. Virtual proxy this is when using a proxy class as an alternative for a real class because the real class is a resource-intensive to instantiate. for example, the videos in the video edit software, where the program wouldn’t load the video with actual size and resolution because it might be huge. Instead it loads a proxy object (video) a light weight version that’ll easy editing. Protection Proxy this one is when using proxy class for authority and access control. You might have already notice that in some website, you are able to browse through and add stuff to your cart or wishlist but when you need to post a review or buy somthing It goes along and ask you to login. In this case a proxy object have been in place of real object. Then when you are about to perform more sophisticate actions. A proxy class authenticate you then load or redirect the call to a real object. Remote proxy this one when the proxy class is local and real object is remote and exists somewhere else. Let’s have a more concrete example, suppose we have shipping company like DHL or FedEx. The shipments arrive airport before it been dispatched to the nearest sorting facilities. With that, we need a mechanism in place to only send parcels to facility that is close to the parcel final destination and ensure that the destination facility is actually not full. To implement a system like that using Proxy pattern. First, will define our interface. IShipment interface in this example it is only going to have one method which dispatchParcel(). Second, will make a proxy class (ParcelDispatcher) and a real subject class(SortingFacility). both are implementing IShipment interface. Below is UML class representation. // with a simple string. var parcel = "SmartPhone" to "North"